A great gift for a Dad who appreciates gourmet food! 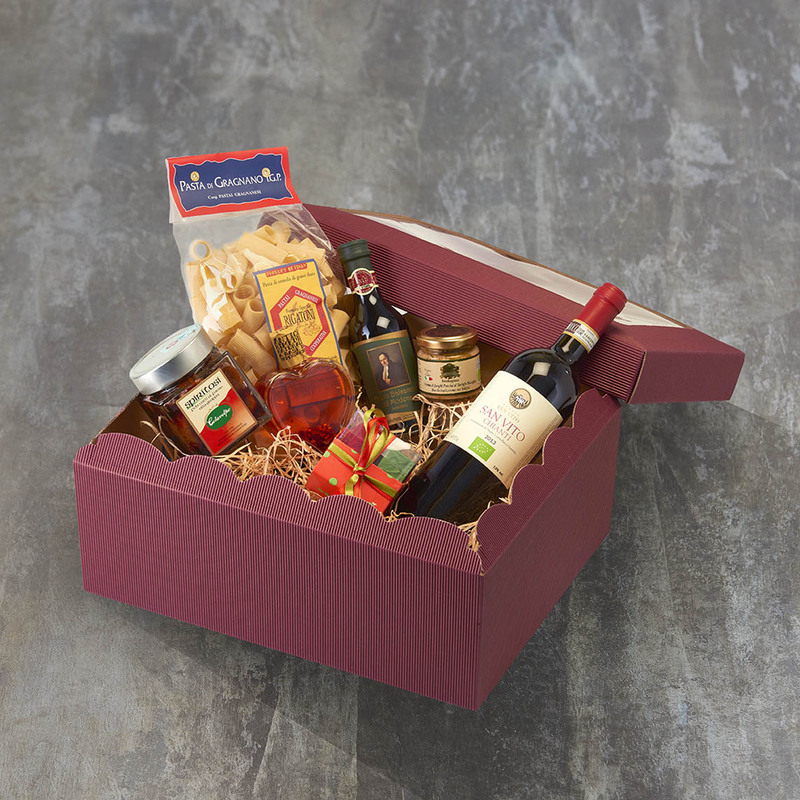 Our Foodie Dad Hamper contains an indulgent selection of delicious Italian products that he will love, from a bottle of our favourite organic Chianti to succulent oven-baked figs soaked in Grappa! Organic Chianti Red Wine (750cl). Our organic Chianti is produced from 100% Sangiovese grapes by the Tenuta San Vito Estate in Tuscany. Dark ruby red in colour, this Chianti has an appealing fresh fruity bouquet. Organic Balsamic Vinegar from Modena (250ml). An excellent bitter-sweet balsamic which is produced from grape musts and wine vinegar derived from organically grown grapes. Organic Porcini and Truffle Sauce (90g). This heavenly sauce has been created using black summer truffles from Acqualagna in Northern Italy and aromatic Porcini mushrooms. It goes really well with pasta. Bronze Die Cut Rigatoni Pasta (500g). Our Rigatoni come from Gragnano near Naples, the home of pasta! Bronze die cut pasta retains its shape when cooked, has a great flavour and texture meaning that the sauce will stick well to it allowing Dad to recreate an authentic Italian pasta dish at home. Hot and spicy Viagro Chilli Infused Oil (100ml). This extra virgin olive oil has been infused with Calabrian chillies and will add a chilli kick to every meal. Known for it's aphrodisiac properties this oil should be used daily - a little goes a long way! 'Nduja Spicy Spreadable Salami (180g). Nduja is cured spreadable Calabrian salami, with herbs, salt and, naturally, lots of chilli pepper. Creme Caramel Chocolates (200g) Luxurious Grand Cru dark chocolate (min 75% cocoa) from the Dominican Republic filled with a burst of sweetness! This gorgeous gift box contains individually wrapped chocolates filled with a delicious cream. Dad's gourmet goodies are packed in a strong burgundy gift box which is tied with a lovely bright ribbon. A gift message option is available at the checkout for you to send him a personalised message.